In this week’s Memorial Day Weekend of Lost Diecast: If you think of a racing movie, its not Grand Prix, Stroker Ace, Days of Thunder, etc. No. Back in 1982, Kenny Rogers starred in a movie called Six Pack. He played a down and out racer named Brewster Baker and with the help of six orphan kids that propelled him to Nascar Cup Series. Well, this lost diecast set from Ertl capitalized from the movie with a Six Pack Diecast cars. The Ford T-Bird, Chevy Camaro dirt car and the Sheriff’s Pontiac Bonneville patrol car. 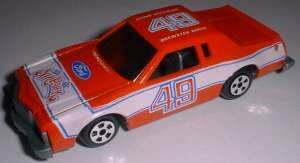 Ertl using the same Pontiac patrol car for every movie diecast car set back in the early 80s. Today if you get lucky on Ebay will cost you a lot of money for it. On this note: Happy Memorial Day and remember the men and women of the Armed Forces who is currently active, veterans and the ones who sacrificed to keep us free to preserve our freedom.